Many of us have broken a toe or a bone in our foot, so you know how painful it can be. Imagine the punishment an Olympic cross-country skier gives that broken bone, in her push to a Gold medal. Justyna Kowalczyk of Poland is another great example of the determination required to win olympic gold. Last Thursday was another unseasonably warm day in Sochi, where the temperature had climbed to 12 degrees (C), which here in America we know as 54 degrees. As the Cross-Country Ladies Classic began, the snow had turned to mush, and the American team shed their sleeves so they wouldn’t overheat. Not the easiest conditions for a “winter” 10K competition which demanded a long climb up a steep hill baking in the sun. At the start of the race, Poland’s Justyna Kowalczyk pushed off fast and by the halfway point was in the lead by 9.1 seconds. By race’s end, the difference between gold and silver was the equivalent of a light year: 18.4 seconds, and Kowalczyk had her second gold medal (she won the 30K classical-style race in Vancouver four years ago). Kowalczyk, 31, is a four-time World Cup winner, and this event was her best chance at gold. No way she was going to sit it out. So her trainer taped her foot before the competition and injected it with an approved painkiller which would last 3 hours (I would have hated to have been her when it wore off!). As her rivals tired in the heat, Kowalczyk showed exactly why this is her signature event, powering forward to finish in 28 minutes, 17.8 seconds. Silver medalist Charlotte Kalla of Sweden was a distant 18 seconds back, and Therese Johaug of Norway took bronze, 28.3 seconds behind. We understand the determination of a dedicated athlete. But we would never advocate that any non-competitor ski or do much of anything with a broken foot. The possibility of further injury and aggravation to the foot jumps exponentially when you subject it to additional stress. Just getting your ski boot on over the fractured bone would be excruciating. 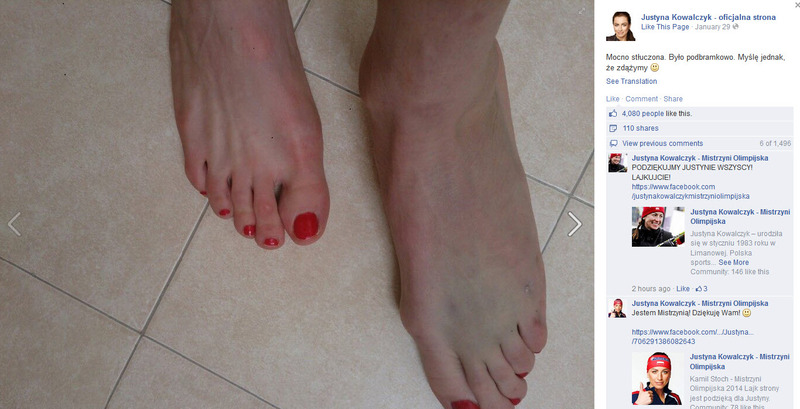 A picture of her broken left foot Kowalczyk posted to her facebook page. Note the discoloration and the swelling. Normally, a metatarsal fracture like Kowalcyk’s requires anywhere from 6-12 weeks to heal, depending on its severity. During that time, the foot would be immobilized with a walking boot or a fiberglass cast. After the cast is removed, another 4-8 weeks of physical therapy would be required to get the foot back into condition. For any athlete, prompt and complete medical care of the break can be the difference between getting back to your competition quickly, or perhaps being troubled by that injury for the rest of your life. We hold up Justyna’s stellar performance as proof that an athletic injury properly cared for, doesn’t mean the end of your athletic career or even your current competition. Way to go.